Saturday, March 9 was a double-wedding day for the Rebecca Calagna Events team. Half of the team went to Temecula Creek Inn for an midday, outdoor “I do.” The other half executed Sabrina and Raul’s wedding with an edge at the Mission Inn, Riverside. The couple waited 21 years to be wed and did so in a way that was true to their love story. 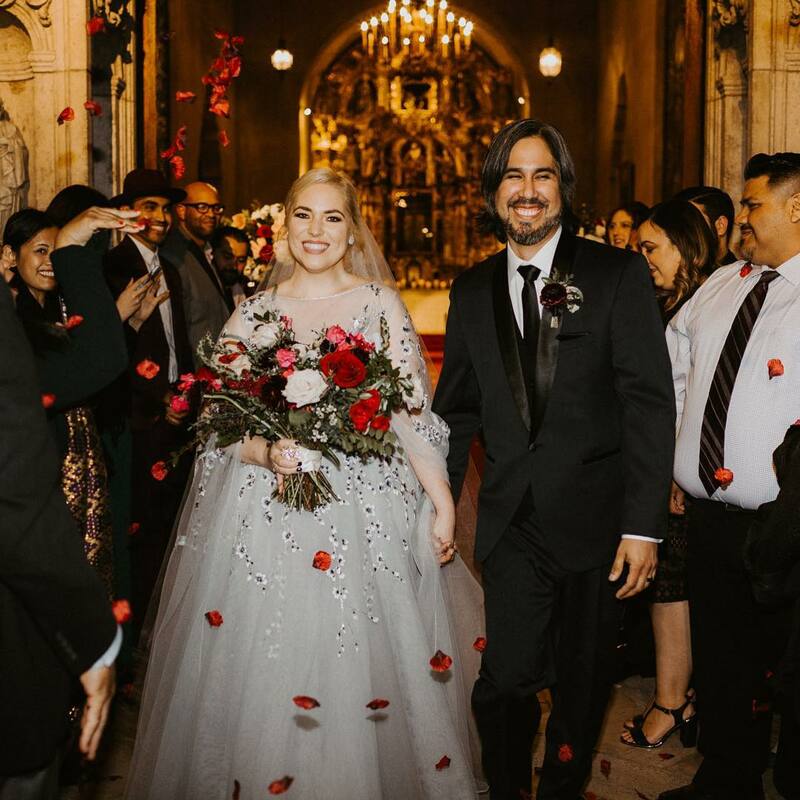 From the candle-lit ceremony in the chapel, to the intimate reception in the Spanish Art Gallery; this celebration of love was artsy and edgy in its personal touches by the couple. The RC Events Team began the day by assembling guest favors. Sabrina and Raul chose to share their love for literature with their guests by giving them a book such as, Romeo and Juliet, A Midsummer Night’s Dream, and Stardust to take home. 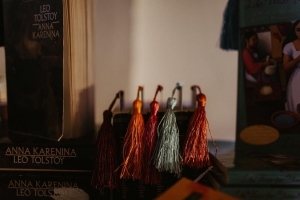 Inside was a custom skeleton bride and groom bookmark adorned with a tassel of a random shade. This made for a festive display against the stained-glass windows of the Spanish Art Gallery. As vendors began to arrive, the art-covered ballroom began to take shape of the couple’s dream day. 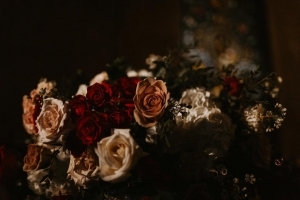 Posh Peony provided excellently crafted deep red, navy, blush, and cream florals for the chapel and table centerpieces. 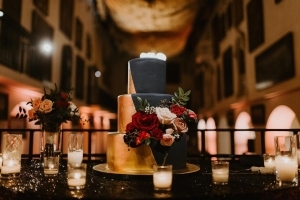 Also, the geometric-designed cake from Cucamonga Bakery made for a great focal point at the bottom of the stairs entering the ballroom. Another unique touch added by the couple was their sign-in table. 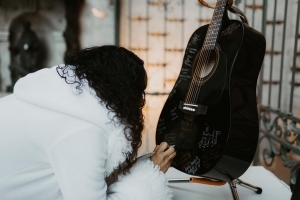 Rather than providing a guest book, the Encarnacion’s had their guests sign a jet-black guitar with gold and silver sharpies. 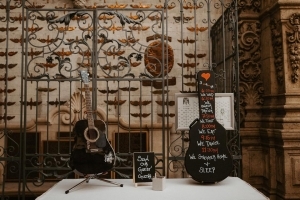 The guitar case was crafted to detail the wedding timeline and stood on top of the sign-in table. Later, the case was laid on its side next to the sign-in guitar and was used as a small gift and card holder. Of all the details, the most awe-inspiring was Sabrina’s dress. 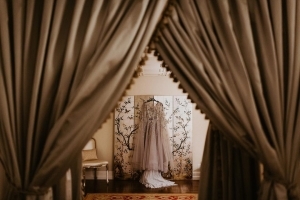 She worked with Bowen Dryden to create a bespoke gown that screamed her name. Her gown was a soft, dusty-blue color adorned by embroidery. The stitched vines, flowers, and birds laid perfectly along the bodice and dramatic sleeves. 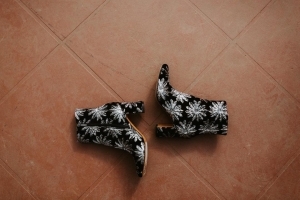 A long train, a light grey ombre veil by The Veiled Beauty, and a pair of flashy, black-velvet booties completed the look. 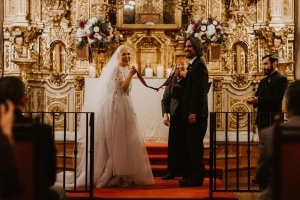 To top it all off, Sabrina and Raul followed a Celtic handfasting ritual where the two made a display of their spiritual union by literally tying the knot in front of their guests. 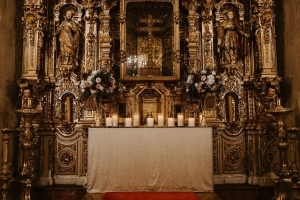 This sweet gesture filled the gorgeous, golden chapel with love. A wedding at the Mission Inn, Riverside is always elegant. 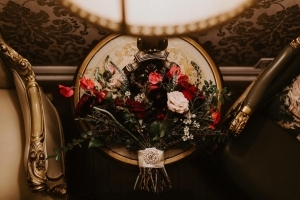 However, Sabrina and Raul’s personal touches added an edgy twist to usual wedding celebration expectations. Their big day was just as unique as their love story. 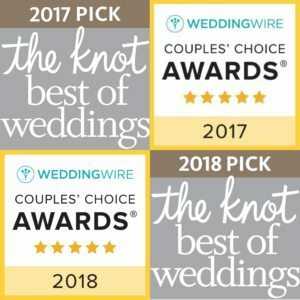 Rebecca Calagna was named a Wedding Wire ‘Couple’s Choice’ wedding coordinator in 2019. Keep up with the RC Events Team as they celebrate love all over Southern California. Schedule a consultation with Rebecca Calagna and take the first step in planning your dream wedding. © 2018 Rebecca Calagna Wedding & Event Planner. All rights reserved.